For our first full day at Disney World I purchased tickets to Mickey's Very Merry Christmas Party. I didn't quite understand why they made us pay extra money to come back in the evening. 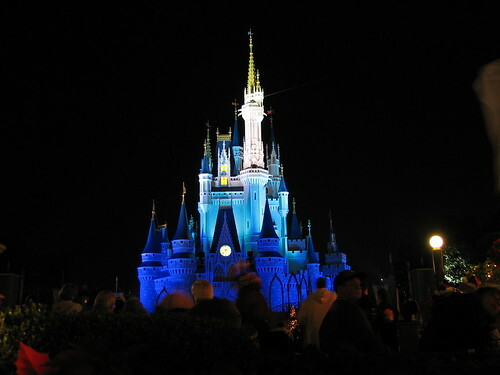 Previously, the evening activities, including the now defunct electrical parade and fireworks display, used to be free. I'm also not sure how they managed to get everyone out of the park by 7pm and readmitted for the party. In the end, we found that it was worth it for the short lines, live Christmas show, free cookies and hot chocolate and fantastic fireworks. On the way to the Magic Kingdom, Dova, who hadn't napped yet, slept on the bus, in the stroller as we wheeled her in, while Adam and Grandma sparred with their new lighted Mickey swords, through the Emporium store looking for an Ariel shirt for her, through the real generated snow blowing on Main Street and finally woke up for the Christmas show. Space Orbiter - We did have to wait a while for this ride, but taking it at night was really like flying around in outer space. Check out the video! People mover in Future World - Adam said he loved space mountain although we tried to explain that he simply traveled through it and didn't actually take the roller coaster ride. Pirates of the Caribbean - Doug had wandered all the way down to the new Pirates ride to see the new Jack Sparrow character while we watched the fireworks. It was unfortunate that I missed the it because Adam just refused to go after being spooked earlier in the day by the Haunted Mansion. Fireworks - We sat to the right of Dumbo as suggested by a cast member and witnessed a fantastic fireworks show originating from all directions. Dova was dancing all around in circles and Adam was whopping and hollering in excitement the whole time. Small World - Before we left, we all piled into It's a Small World. Grandma kept telling us that when I was 5, I loved it and had to take it 3 or 4 times. Adam pretended to hate it, Doug truly hated it (he calls it a bad dream) and Dova loved it. I just took tons of pictures and put lots of flash dots into Doug's eyes. Grandma loved watching Dova take it all in. It also served to warm us all up as it was pretty chilly during the fireworks. Cool video. I've never been on that ride.....of course it has been a long time since I've been down to Disney. One thing I remember oh so clear was how they were masters at "hiding" the line! I understand there is a system of signing up for a ride in a time window which helps quite a bit to tame the lines.